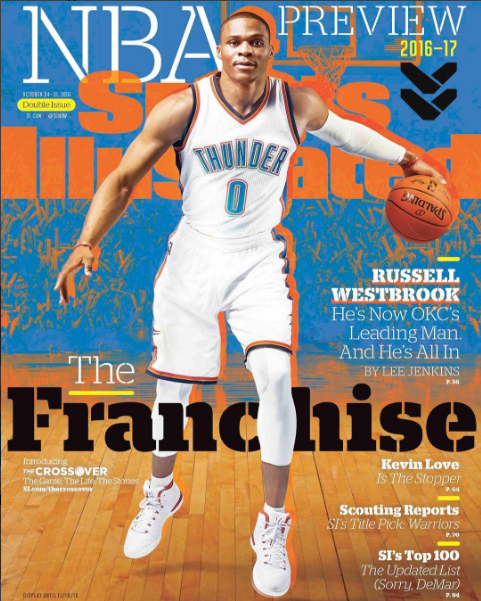 Russell Westbrook is quite the cover boy this month. 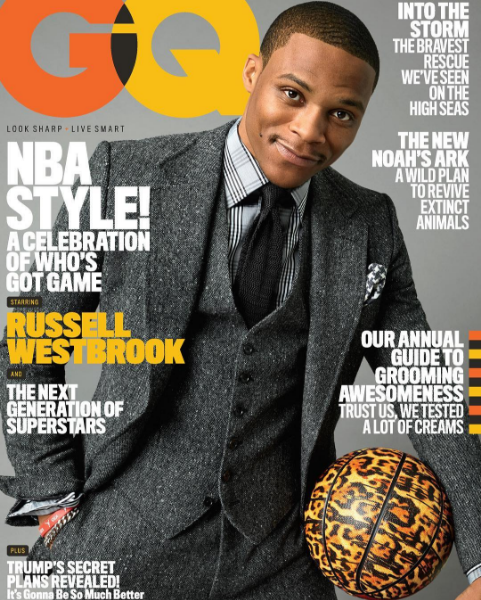 The Oklahoma City Thunder star, who is set to begin his scintillating Anger Tour without relocated sidekick Kevin Durant, has been on the GQ cover and now, gulp, Sports Illustrated. ... but the SI image made us cringe. This is bad, why, you ask? If you've heard of the Sports Illustrated jinx, you know the deal here. If you haven't, take a look at what disastrous results have been spawned after the publisher decides to shine a light on a particular athlete or team. November 2, 2015: Daniel Murphy appeared on the cover for his outstanding October appearance for the New York Mets in the 2015 MLB playoffs leading them to the World Series. He later went on a slump that deflated the team and its entire fan base. In Game 4, he made two costly errors and after the Royals celebrated a Fall Classic win, Murphy left the Mets and signed with their division rivals in the offseason. November 17, 2015: Retiring race car driver Jeff Gordon appeared on the front cover five days before his final race. After starting fifth, he led two laps but he quickly fell to fifteenth and after a long battle he finished sixth in his final race. The 2015 NFL Season: SI featured the Baltimore Ravens to represent AFC in the Super Bowl 50 but their season went into a downward spiral, thanks to injuries to many key players including quarterback Joe Flacco. The finished 5-11. November 24, 2015: The 12-0 Iowa Hawkeyes appeared on the cover but lost to the 11-1 Michigan State Spartans in the 2015 Big Ten Football Championship Game 16-13. Michigan State ended up in the College Football Playoff. The Hawkeyes were later forced to go to the Rose Bowl, where they lost to Stanford, 45-16. January 5, 2016: Minnesota Vikings running back Adrian Peterson appeared on the cover promoting the Vikings' NFC North title. However, the Vikings lost to the Seattle Seahawks 10-9 thanks to kicker Blair Walsh's missed chip shot field goal. February 2, 2016: Carolina Panthers quarterback Cam Newton appeared on the cover promoting their appearance in Super Bowl 50. However, the 17-1 Panthers were upset by the Denver Broncos 24-10. Thud. March 5, 2016: Conor McGregor appeared on the Feb. 29 issue. He was initially scheduled to fight Rafael dos Anjos, but it was cancelled due to Anjos' broken foot. The fight was rescheduled to be against Nate Diaz on March 5. McGregor lost in a second round submission. Unreal. March 14, 2016: North Carolina Tar Heels forward Brice Johnson appears on a regional cover promoting "March Madness." However, the Tar Heels lost to the Villanova Wildcats, 77-74 behind Kris Jenkins' 3-pointer at the end of the game. Woof. March 14, 2016: San Antonio Spurs forward Kawhi Leonard appeared on a regional cover promoting the Spurs' chances at winning the NBA title. However, the Spurs lost to the Oklahoma City Thunder during the Western Conference Semi-Finals in six games. Pop wasn't happy. March 28, 2016: Oklahoma Sooners guard Buddy Hield appeared on the cover hyping Oklahoma's appearance in the 2016 Men's Final Four. However, the Sooners were blown out by the Villanova Wildcats 95-51 as Hield probably had his worst game ever. SMH. May 30, 2016: Oklahoma City Thunder forward Kevin Durant appeared on the cover promoting the Thunder's possible upset over the defending NBA Champions the Golden State Warriors in the 2016 Western Conference Finals. But the Thunder blew a 3-1 lead to the Warriors as the Warriors won the series 4-3. And now Durant is on that team. You can't make this up. April 2016: New York Mets pitchers Matt Harvey Jacob deGrom and Jeurys Familia appeared on the cover. Matt Harvey had the worst year of his career and was forced to undergo season ending surgery, while Jacob deGrom also went under the knife. And how can we forget -- Zack Wheeler and Steven Matz were later injured and both are out for the season as well. October 2016: The Chicago Cubs ... we'll find out soon enough. October 2016: Russell Westbrook ... *Praying hands* (please help nothing happen to this man).